The Urban Development Boundary (UDB) is a zoning tool in Dade County’s Comprehensive Development Master Plan (CDMP) that restricts high density and industrial uses in the western and southern portions of the County that lie outside it, separating metropolitan Miami Dade from the Everglades through a greenway of farms, nurseries, low density housing, and wetlands. The CDMP also contains several areas referred to as Urban Expansion Areas (UEA’s.) These are areas into which the County may choose to expand the UDB at some point between 2020 and 2030. The UDB protects our water supply as agricultural lands, wetlands and large lots outside the UDB all provide adequate open space to provide well-field recharge to restore water withdrawn from the Biscayne Aquifer, our chief drinking water source. Many large well-fields lie outside the UDB. It also protects our local food supply, as agriculture is an important part of Miami Dade’s economy, and provides the capacity for local food production. It protects our citizens, the farms and wetlands outside the UDB offer a buffer to flooding that helps keep Miami Dade residents safe during storm events. Development of this region would put all of its potential new occupants at risk of flooding as well as potential health effects associated with living next to heavy mining operations and at a distance which virtually guarantees impossibly long commutes. Every 7 years the County updates the CDMP under a process known as the Evaluation Appraisal Review. In May of 2017, MDC Mayor Carlos Gimenez began to assemble a Urban Extension Areas Task Force to investigate potential changes to the Land Use Plan to include land in these UEA’s as developable under the ongoing EAR. These areas identified are in conflict with the CDMP, for example: on wellfield protection areas, adjacent or overlapping with CERP, low lying and in flood prone areas. 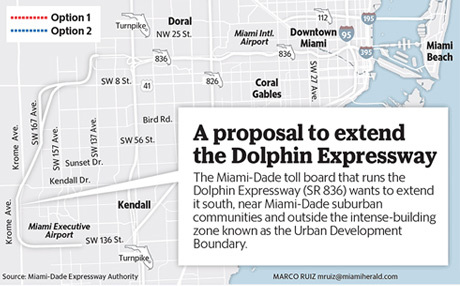 The Miami Dade Expressway Authority (MDX) is already under way to extend the SR836 past the UDB. This plan was defeated twice through resolutions last year but Mayor Gimenez brought it back under the EAR October cycle 2017 by having the Department of Regulatory and Economic Resources (DERM) as the applicant. This proposal sits in direct conflict with everything the County should be doing to make us more resilient in the face of sea level rise. Agriculture and resilient infrastructure must be taken into account while making decisions. Furthermore, there’s an urgent need for infill development in high density areas that are of high elevation, near existing or planned transit corridors. Development should not be allowed on land lying in flood zones as any area identified as “Coastal High Hazard area” and should instead prioritize the protection of lands deemed crucial for aquifer recharge and environmental resilience in order to maintain livability in South Florida. Moving the UDB will not only encourage development on sensitive areas that preserve vital resources the County needs for aquifer recharge, to protect our communities from floods, sea level rise restoration efforts and continued farming to support the increasing population. As development sprawls further west, the County is obligated to provide utilities and services to these newly developed areas. This all costs taxpayers money, which could instead go towards providing the robust public transit infrastructure that might actually solve these issues. The only way forward is to look for sustainable solutions with a plan to build our infrastructure based in smart growth through policies and investments that encourage urban infill, walkability, and transit oriented development systems that will make our streets safer. The ideal solution for our transit challenges would be to implement the Seven50 plan, which could be operated in conjunction with the SMART plan to offer a better menu of transportation options with a chance to build a strong, competitive, environmentally responsible and resilient region. The Seven50 plan (seven50.org) stands for seven counties in 50 years, a blueprint for growing a more prosperous, more desirable Southeast Florida during the next 50 years and beyond, committed to work collaboratively across jurisdictional boundaries to create a regional plan for sustainable development.